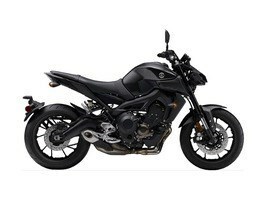 2018 Yamaha MT-09 CONQUER ROAD Upon its introduction in 2014, the MT-09 instantly became one of the most acclaimed motorcycles on the market. Powered by an exciting 847 cc three-cylinder engine, the popular naked sport roadster features fully adjustable suspension, three riding modes, traction control, slipper clutch, standard ABS and aggressive "twin eye" LED headlights. Experience the thrill of riding every time you hit the road. POWER Liquid-cooled 4-stroke, 847 cc inline 3-cylinder fuel-injected engine with a downdraft intake. The engine has been tuned to provide plenty of low to mid-range torque with strong yet linear throttle response. BRAKES ABS equipped brakes feature dual 298 mm discs with 4-piston calipers up front and a 245 mm disc with single piston caliper in the rear providing peace of mind while braking under pressure or in wet conditions. STYLE The MT-09 features an aggressively styled twin-eye headlight assembly that gives this best-selling naked sport a more menacing look. The slanting dual headlights are equipped with four LED bulbs, accompanied by dual LED positioning lights. Features may include: ENGINE Slim, compact, 847cc, DOHC, 4- valve, liquid-cooled, 42.5 degree inclined, inline-three cylinder engine. The engine has been tuned to provide plenty of low & mid-range torque with strong yet linear throttle response. Valve adjustment intervals are every 42,000 kms. 120 degree crankshaft. Lightweight "coupling force balancer" is used to reduce engine vibration for excellent rider comfort. "Fracture split" connecting rods feature a "nut less" design. Lightweight, forged, aluminum short skirt pistons. Direct ceramic composite plated cylinder uses "liner less" bores. Offset cylinder design. One-piece cylinder and upper crankcase assembly. Lightweight hollow camshafts. CHASSIS / SUSPENSION CF (Controlled Filling) die cast, twin spar, diamond-type, aluminum frame Riding position is one of the most important features of the MT-09 chassis. Detachable, round tube steel rear sub frame. Externally mounted, C.F. (Controlled Filling) die cast aluminum, truss-type rear swingarm. Fully adjustable, 41mm inverted fork offers 137mm (5.4") of wheel travel. Lightweight, aluminum upper & lower triple clamps. Adjustable link-type Monocross rear suspension with 130 mm (5.1") of wheel travel. ABS equipped, dual 298 mm floating front discs squeezed by radial mount, mono-block, 4-piston calipers. ABS equipped, 245 mm rear disc squeezed by a lightweight single piston, slide-type Nissin caliper. Anti-lock braking system (ABS).